French lesson immersed in the Poplar French perfume world, and a peek into the latest trends in Fragrance. When it comes to the art of perfumes, France ranks as exceptional, and considered to have produced best popular French perfume in the world, mostly thanks to many of the greatest names in the perfume industry. Chanel, Christian Dior, Hermes. However recently there has been a seismic shift.Today’s blog discusses what has changed. We also share with you some important French vocabulary relating to perfumes and guide you in discovering the best places to explore the fascinating world of French perfume in Paris. Now that you have the tantalising adjectives sorted, I have listed the top ten most iconic French perfumes that have put France on the map as THE destination for everything to do with Fragrance. So now you are in the know as to what is (or was in the past) considered the best French perfume brands let’s look at where French Fragrance is and will be moving in the future. The exciting part is the growth in new artisan perfumes in Paris like Frédéric Malle. French Artisan perfumes in Paris: a more personalized touch. In Europe and Paris, (the European epicentre of Fragrance), mass perfume brands are very much falling out of favour while artisan perfumers are becoming more popular. It’s rather like the growth of craft Beers around the world, where global brands no longer capture the essence of our individuality and style. We want to be different, we want to be in the know, we want to be ahead of the trends, be it in Beer, Champagne, or in this case- Fragrance! For those looking for something unique, Niche industries are joining the mass market, providing artisanal and natural scents. Moreover, there is a definite trend away from anything artificial. Many people are turning to natural, non-toxic perfumes. Fragrances that contain the health benefits that essential oils bring. I have outlined 3 new French artisan perfumes that are very much worthy of your time. The first of 3 new French artisan perfumes are Serge Lutens. Lutens is a multi-talented artist whose careers encompass fashion design, perfume design, hair styling, photography and film-making. In 1992, Lutens created Les Salons du Palais Royal – a former bookshop in Paris's Jardins du Palais Royal, converted into a house of perfume. He was inspired by art, literature as well as the Parisian surroundings. His creation “Feminité du Bois” (1992) is highly regarded and is sweet, woody, resin-like in its appeal. The second of 3 new French artisan perfumes of note are Annick Goutal, an artisan perfumery in Paris, has its own in-house perfumers. Apart from the fact their fragrances are uniquely individual, they are well known now for their fine detail of the perfume bottles which are finished by hand. The boutique claims that each evocative scent will “take us on a journey”, and therefore place high importance in how the perfumes are presented. For example, the perfume ‘Un Matin d’Orange’ evokes the fragrance of a “gardenia in the mist of a stormy morning”. Stunning bottles! And the third of 3 new French artisan perfumes is Frédéric Malle, grandson of Serge Heftler-Louiche, who founded Parfums Christian Dior, introduced Editions de Parfums in 2000. Malle looks for perfumes that have been designed “to uniquely merge with the wearer’s skin” as perfumes smell differently on each individual. What differentiates this brand from the traditional French fragrance names, is that they offer fragrances composed by the world’s greatest noses, sold under their own names. In an era in which most companies value intensely market brand names (not their creators), Malle draws attention back to the product itself: namely perfume, Editions de Parfums is challenging all prevailing trends by getting back to what is important: the fragrance, NOT the brand. “Les pétales”: petals, any of the usually brightly coloured parts that together form most of a flower. So now you know a little more about all things French Fragrance, it’s time to check out some beautiful shops and museums dedicated to this craft. Frederic Malle, has launched his fourth boutique. The store, located in Paris at 13, Rue Des Francs Bourgeois, features a ‘hive’ of plywood bookshelves that display Malle’s fragrances. The flooring, walls and ceiling are mirrored, which is said to create an effect of endless complexity and infinite reflections. Meanwhile, portraits of the perfumers behind the brand are hung centrally in-store. A must visit for unique and individual French perfume for women as well as French perfume for men. After all, it is just as important for our man to smell as delicious as us! And if you are visiting The Marais, I recommend popping in to L’artisan Parfumeur. If you are ready for an olfactory and evocative experience, you should go in Le Marais. There are many perfume shops in Paris, but L’Artisan Parfumeur certainly stands out as one of the best because it’s quintessentially French; “complex a la fois simple” yet luxurious. L’Artisan Perfumeur makes eau de toilette, candles, and home fragrances whilst emphasising its artisanal methods. If you’ve been searching for something truly original that speaks to your personality, you’ll have more luck finding your signature fragrance here. After all, most well-known brands can be purchased around the world in department stores and fragrance shops. And yes, you can buy French Perfumes online, however there is nothing quite like the heady ambiance of a fragrance shop! you have not been able to find at one of the major beauty chains. “Une parfumerie”: a perfumery shop. “Un flacon de parfum”: a bottle of perfume. “Une eau de toilette”: a dilute form of perfume. “Une eau de Cologne”: originally a toilet water with a strong, characteristic scent, originally made in Cologne, Germany in 1708. “Une eau de parfum”: a perfumed liquid containing a percentage of fragrant oils that is lower than that in perfume but greater than that in eau de toilette. “Un extrait”: A preparation containing the active ingredient of a substance in concentrated form. “Une essence”: an extract or concentrate obtained from a plant or other matter and used for flavouring or scent. “Une lotion”: A thick, smooth liquid preparation designed to be applied to the skin for medicinal or cosmetic purposes. “Un elixir”: a substance usually liquid, with a magical power, to cure, improve or preserve something. “Un bouquet”: The characteristic scent of a wine or perfume. “Une fragrance”: a sweet or pleasant smell. If you are interested in perfumes, you shouldn’t miss the new museum totally dedicated to the subject. 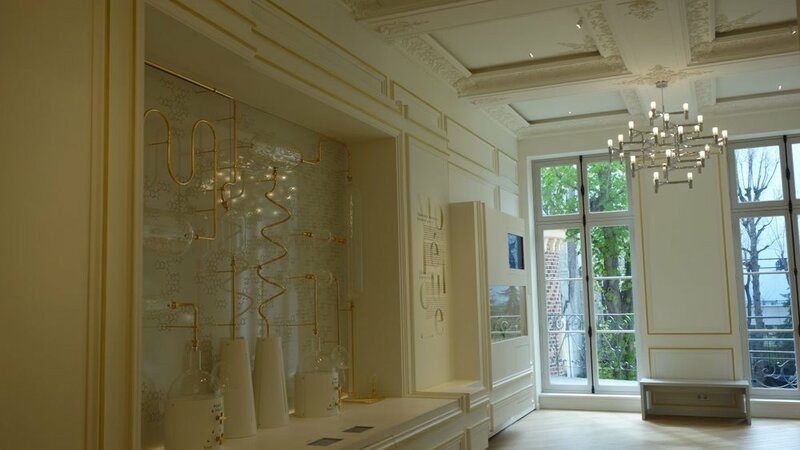 Le Grand Musée du Parfum just opened In December 2016, in Faubourg Saint-Honoré street, in the historical building dating from the XVIIIth century that once hosted the Christian Lacroix fashion house. The museum’s content takes the form of a “multi-sensory” journey through the history and science of scent and perfume-making. Featuring a host of hi-tech graphic, video and sound installations. You will also learn about the role of a perfume makers “Le Nez” (nose ). 66 fragrances are presented in this Museum. French a la Carte- Paris has designed personalized walking tours incorporating fashion and food whilst at the same time learning the French language. 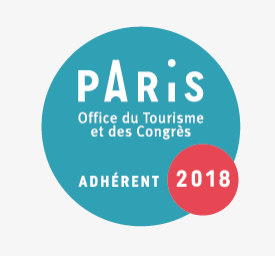 We will soon be curating unique personal tours French language tours centred around the world of fragrance. Sign up to our news letter on the right hand of this page for updates. French a la Carte Paris- Personalized French lessons. Live like a Parisian for a few hours. Explore Paris and learn French in while conversing in the expressive language of French. And before I say goodbye, a look back as to the evolution of the word Perfume. is derived from the Latin word, "per fumus," meaning through smoke. The word Perfumery refers to the art of making perfumes. Rather descriptive “to impregnate with a sweet odour; scent.” See you soon! “a tout suite! French Vocabulary And Politics : Background On The Presidential Election.